Okay, so it hasn't been years, more along the lines of a month or two. So, having started at a skill level of zero, I've now moved up the skill ruler to perhaps a three ... Perhaps. 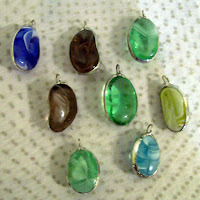 A few days back I'd wrapped up some big chunky glass pieces and this morning I finished soldering them. 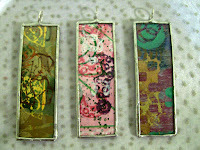 I also wrapped up three more glass pieces, using some of my handpainted grafitti paper in the middle. Altogether I put 3 layers of solder on them. On the last layer, I then held it too tight with the pliers and cracked the glass. (I did pull it open and rescued the paper, which I'll rewrap tomorrow). I also another layer on a a couple of the others. Tomorrow I'll decide if these need more solder, or if I'm going to get out the dremel and finish them off. Of course, the biggest question bothering me at the moment is what to do with them. They certainly are not give away or sell quality, but I sure hate to just throw out, Decisions, decisions, decisions.